For many, Jonn Serrie is the gateway to Spacemusic. And how fortunate these neophytes are to have such an exemplary musical experience with which to measure all their future explorations against. 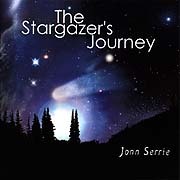 Serrie's music is often cited as the standard in a well-populated field and his release The Stargazer's Journey (60'01") is an instant classic. The album contains six pieces, each one more discovery than construct, and extols the mystery and magnitude of the truth and infinitude of the clear night sky. Rather than traveling through or creating space, The Stargazer's Journey considers the diurnality of the celestial sphere and portrays our pondering earthbound lives beneath it. The music here is warm, shimmering and curvaceous; its sonic imagery ignited through Serrie's beautiful synthesizer pads and effects. The smooth and reverential "The Star's, Like Dust" stretches out to a roomy 15'36" and will resonate with anyone who has had the opportunity to peer out into eternity's engine from the clarity of a dark vantage point above the clouds - an experience larger than the everyday; one where we are faced with the incomprehensibility of our place in the vastness of the milky way. The album's tonal organization and coherence are well conceived while deceptively seeming to drift randomly between tones and textures. The tracks "Goldstone" (8'33") and "The Stargazer's Journey" (8'47") evolve in the classic style of: exposition... action... exposition... where circles, cycles and intersecting orbits of swirling globes are represented as a drifting opening out of which a repeating monophonic bass tone arises along side glowing harmonious synth pads, then gently returns to a nebulous solemn conclusion - the listener now traveler and sensing the movement of the earth through space. Too heavy for you? Then just focus on Serrie's excitement over the indivisibility of the universe and its unimaginably vast distances, it has been there throughout his 20 years in his music. "Where my thoughts are, there am I in truth".